Always on the look out for something a bit different to the norm, we have sourced this great looking Scandinavian designed banner stand, which just oozes contemporary style with its unique maple veneered base. Sure it will cost you a bit more than our standard banners, but then a BMW costs more than a Ford! 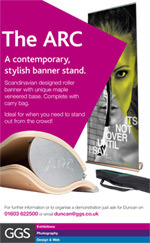 Take a look at our ARC Banner Stand E-Shot for more information about this product. To see more banner stands from GGS take a look at our Portable Display Stands page.